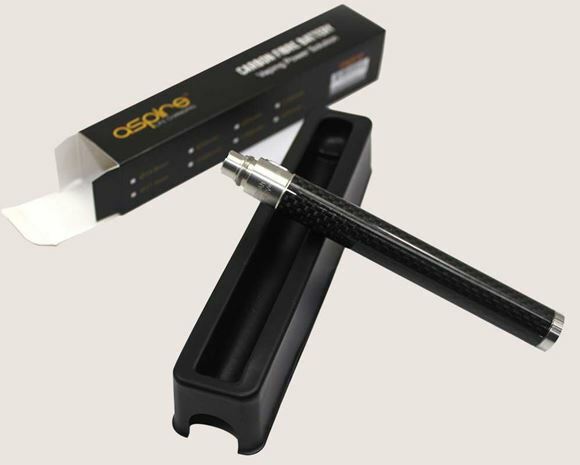 The NEW Aspire CF VV range of batteries are suitable for use with any Ego or 510 fitting cartomiser, clearomiser or tank as it comes with nice beauty collar/ring and perfectly suits with our Aspire Nautilus Mini and Aspire Nautilus BDC range. The Aspire Carbon Fibre CF VV 1300mAh Battery are so much better than any other eGo batteries currently on the market, in terms of build quality - look & performance, that we have stopped selling competing product in a similar price range. We will continue to offer our customers to Kanger VT8 Atomiser because of its good build quality and lower price point. It is a "beautiful" battery first if all, has the carbon fiber material wrapped around a brushed metal body. Feels just right, not too heavy not too light, very balanced in hand, albeit a bit thin for the regular Aspire Nautilus tank, but it is perfect for the Mini (2.5ml) tank. The length is perfectly fine and very easy to carry entire battery in palm. PERFORMANCE WISE, it lasts an entire day depending on your vaping habit, however, on days when you don't vape a lot (or chain-vape) it will last to the next morning. Take it off the charger in the morning and put it back at night. 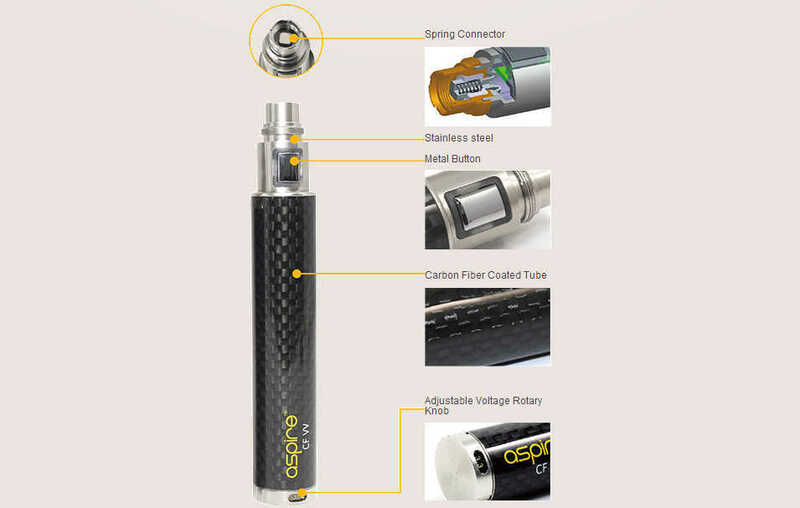 Buy two Aspire CF VV battery so that one is always charged and never run out of power. The voltage dial is on the bottom, and it can be a bit loose or too tight to turn. Set it at between 4.1-4.4v. Just before it is out of power, the power button blinks orange severa times to warn you. Up to the orange light, it is very consistent. Unless for once a while you get a bad coil, it can play trick on the battery making it to "think" it is out of power or start to "short", then it will blink several times of blur and stop. Hence, we always recomend to buy genuine quality Aspire Replacement Coils, we have both Aspire Nautilus BDC Replacement coils as well Aspire Nautilus BVC replacement coils and Kanger EVOD Coils in stock. Original coils protects your battery and lasts longer. The batteries are finished in a carbon fibre and come in a choice of 4 colours and 2 different capacities (1000 and 1300mah). The larger the capacity = the longer the runtime between charges.